The Lesser Violence Reading Group is envisioned as an open and interdisciplinary discursive space, organized by GALA (Gay and Lesbian Memory in Action) and VIAD (Visual Identities in Art and Design, UJ). Over the course of four interactive sessions, a maximum of fifteen Reading Group participants will be guided through readings that cover the broad subjects of gender, sexuality, violence and visuality, with an emphasis on performance. These discussion will be located within a contemporary South African context, and in dialogue with concurrent discourses from the continent and its diaspora. Each session will be led by a different group of invited presenters from a variety of fields including, but not limited to: activism and social justice, art, art history, performance, theatre, and journalism. Through the Reading Group programme, GALA and VIAD hope to bring together gender activists and artists in a comfortable and intimate setting, in which conversation around these sensitive topics may be allowed to flourish. Equally, the reading sessions are an opportunity to engage with innovative texts, writers and theorists from South Africa and the continent. ‘Readings’ are not limited to academic texts, but can include films, images, music and sound, as well as newspaper and magazine articles. Participants are welcome from any field, and from any point in their education. The sessions are intended for all who would like to further their intersectional understanding, and would like to meet with like-minded individuals. The idea for this reading group emerged from last year’s ‘Lesser Violence’ panel discussion, hosted by GALA and VIAD (31 August 2017) and facilitated by VIAD curator and researcher Amie Soudien. With contributions from artists Donna Kukama, Gabrielle Goliath, Nondumiso Msimanga and Senzeni Marasela, the aim of the discussion was to bring together a community of artists, writers, curators and activists with a shared interest in gender rights, and to initiate dialogue around artistic (and especially performative) strategies for working with, through, around and against the enactment and perpetuation of gendered and sexualised violence. 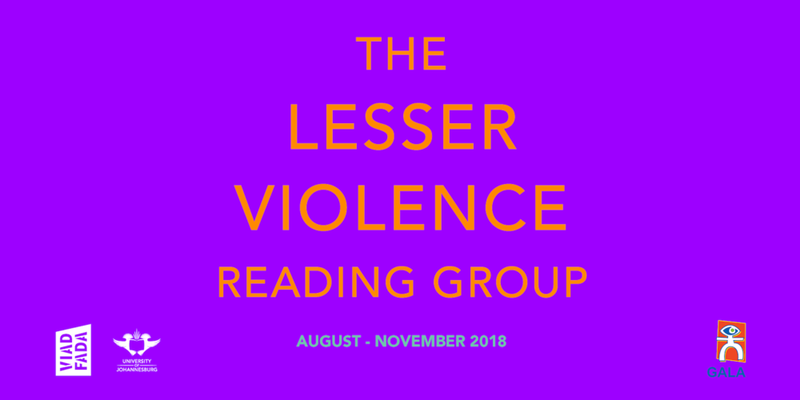 The Lesser Violence Reading Group is envisioned as one way of furthering the close conversations, interactions and collaborations initiated by this engagement. In naming the panel discussion (and now reading group), our reference to ‘lesser violence’ recalls Jacques Derrida’s conception of an ethics hinged not on the prescriptive certainty of an ‘ought’ or ‘should’, but on the “ordeal of undecidability” and the possibility of a “lesser violence”. Accounted for here is a terrain of risk in which decisions are made, and must be accounted for, without the guarantee of them being ‘right’ or ‘good’ but at best as constituting a lesser form of violence. The opportunity presented in this reading group is to explore this complex ethical space in relation to performative practices seeking to engage with, and make ‘shareable’, incommensurate experiences of violence and trauma.